This month's event is being hosted over at Jimmy's Cocktail Hour. The theme is "Whisk(e)y". Jimmy has chosen the topic Whisk(e)y — note the optional ‘e’. Got a great cocktail made with rye or Irish whiskey? Like a particular bourbon or single malt all on its lonesome? Can’t stand the stuff thanks to an unfortunate episode during college that included a mechanical bull and way, way too many Jack & Cokes? Let’s hear about it. If you would like to participate, please post in this topic before Monday, February 12th at midnight. I will compile a list of cocktails posted and mail them to the organizer. I can't really imagine a much more open theme, unless it was Gin! The mind boggles! Oh Yeah. I am all over this one. Would a drink with Red Hook Rye disqualify me? Not sure why making your cocktail with Red Hook Rye might "disqualify" you. I mean, the rest of us will certainly be rather jealous. But, I guess that will just force us to come up with something equally envy inspiring. Well I wasn't sure if there was anything about it having to use ingredients that could be found easily. Ok, I'll play. Here are a couple of recentish creations with whiskey (rye, natch, although both will work fine with a bonded bourbon), both pretty antique in their conception. Strain into chilled cocktail glass and twist thin-cut swatch of orange peel over the top. Strain into chilled cocktail glass nad grate nutemg over the top. Then smile. Shake with cracked ice and strain into chilled cocktail glass. Garnish with lemon twist. If it's okay to do so, I'll probably cross-post my contribution here and on my own blog. That's some good stuff. Unfortunately, I couldn't afford a bottle when LeNell had them available, but I sampled some and liked it a lot. Fritz Maytag, by purchasing the Anchor Brewing and re-launching it as a small scale, quality conscious brand, is considered by many to have launched the craft brewing movement in America. 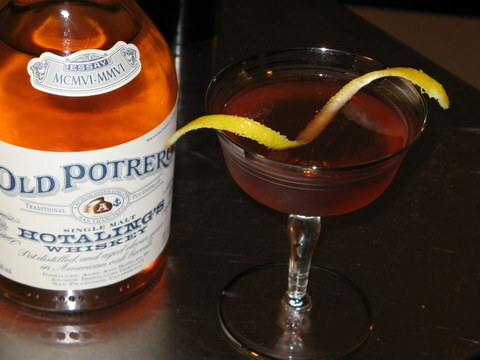 In 1993, his launch of Anchor Distilling, with its Junipero Gin and Old Potrero Whiskeys, pre-dated the current craft or micro-distillery trends and enthusiasm for Rye Whiskey by several years. But, neither the beers nor the distilled spirits have taken an easy path. The whiskeys Anchor Distilling chooses to make are made from 100% malted rye. An unusual choice by any stretch of the imagination. Rye is notoriously difficult to malt without at least some barley to get the enzymatic reactions necessary for fermenting started. Then there is the choice to make whiskeys according to unusual historically based models. Anchor ages its whiskeys for very short periods before releasing them. The 18th Century Whiskey is aged in toasted, rather than charred, oak, so cannot be labeled "Straight Rye Whiskey". Some have said the Anchor Whiskeys are the best, and most interesting, under aged spirits on the market. All have hoped that Anchor Distilling would release a 10 or 20 year old version of their whiskeys. In 2006 spirits enthusiasts finally got to taste an aged Anchor Distilling whiskey. To commemorate the 100th anniversary of the 1906 San Francisco Earthquake, Anchor released its Old Potrero Single Malt Hotaling’s Whiskey. Drawn from the very first batch of 100% Malted Rye Anchor Whiskey, and aged over 11 years in once used, charred, oak barrels, it is an unusual pour. Some have said it has more in common with Scotch whiskey than American whiskey. In production methods and the climate in which it is aged, I agree. On a practical level, it tastes like no other whiskey I have tried, and certainly not a Scotch. Given the cost, and, the fact that it is unclear whether Anchor will ever release another aged whiskey, some might say mixing is a bad choice. They would probably say, the spirit should properly be enjoyed on its own, in all its quirky glory. As a cocktail enthusiast, however, the Hotaling’s has haunted me since I first tried it. It seemed like it would, in fact, make a very interesting, if pricey, mixing whiskey. The question was, how best to feature its characteristics. While the predictable Old-Fashioned or Sazerac Cocktail would be the easiest route, I thought I’d first give it a try in another San Francisco creation, Jonny Raglin’s Bob Tailed Nag. Stir well with cracked ice and strain into cocktail glass. Garnish with lemon twist. This was OK; but, I found there was a missing note in the cocktail compared to when I’d made it with straight rye whiskey. When I've tried the Hotaling's on its own and when I was tasting the Bob Tailed Nag, its flavor reminded me a bit of a Cognac, so for my second try, I decided to replace the Cognac in a classic cocktail with the Hotaling’s. Stir well with cracked ice and strain into cocktail glass. Garnish with cherry. The Metropole is a cocktail I was only recently made aware of via a Splificator (David Wondrich) post here on the eGullet forums. Mmmm… Yes, now here is a cocktail, and a use of the Hotaling's, that I can hang with. The fruity, wine-like, flavor and scent of the Hotaling’s Whiskey work perfectly in this dry, complex cocktail. I just tried the Metropole and must say that it is excellent. Thank you for introducing it to me. The 1:1 ratio of cognac to dry vermouth makes it a pretty low alcohol drink, which is fine. I think 2:1 or 3:1 would be good as well. Is there more information about the history of the drink, other than what was posted on that thread you linked? Esquire Drinks writeup on the Metropole. Ok so I got off at 12:30 and gave my MxMo entry it's actual taste test while watching the final three episodes of Arrested Development with my roommate and eating smoked sausage (yum). Hence my excuse for the very late posting, but it's still Monday somewhere on the globe. I drink a fair amount of Whiskey, mostly rye, since it is more fun to mix with, although I have a deep and sincere love for Irish whiskey that for some reason rarely manifests itself. Canadian is meh, ok, but rarely called for in cocktails, and Scotch is something I find myself with only an occasional taste for, despite my very first "real" cocktail being a Rob Roy. My favorite drink of all-time is definitely a Manhattan (rye, of course), and liberal quantities of Old Fashioneds (roommate's fave) and Sazeracs are consumed around the house as well. But with all this whiskey flowing I still wanted to try something new for MxMo, as a chance to broaden my own horizons while having them broadened by everyone else's entries as well. A search through my books and favorite online resources and I settled on the Suburban from Mr. Dave Wondrich's Esquire Drinks (though that book alone made picking one difficult). I made the recipe 50% larger to split between 2 small glasses, worked well. Interesting drink, I must admit. I didn't really expect the rum's flavor to shine through that way. The flavor was not quite what I was expecting, but on the whole rather pleasant. As I made it here not quite good enough to enter the regular rotation, but it definitely shows promise. I think next time I try it (soon, or it won't be winter here anymore) I'll go with either A: a stronger flavored whiskey, like Wild Turkey, B: a less assertive rum, like Bacardi 8 (new addition, eager to try it out) or Appleton V/X, or C: both. I think the rum definitely is meant to be much more of a background accent. Here I kept finding myself thinking "Hmm, everything about this is like a nice deep rich whiskey drink, except for the persistent aftertaste of rum--how odd." Definitely one worth trying and if I get around to fine-tuning the brand choices I'll be sure to post it somewheres around here. Edit: Because the theme was not "Whikey"
Interesting drink, I must admit. I didn't really expect the rum's flavor to shine through that way. The flavor was not quite what I was expecting, but on the whole rather pleasant. As I made it here not quite good enough to enter the regular rotation, but it definitely shows promise. I think next time I try it (soon, or it won't be winter here anymore) I'll go with either A: a stronger flavored whikey, like Wild Turkey, B: a less assertive rum, like Bacardi 8 (new addition, eager to try it out) or Appleton V/X, or C: both. I think the rum definitely is meant to be much more of a background accent. Here I kept finding myself thinking "Hmm, everything about this is like a nice deep rich whiskey drink, except for the persistent aftertaste of rum--how odd." This one is definitely about fine-tuning the brands. Sometimes when I make it it's ambrosial, other times not so much. It's definitely an odd one. I've had good luck with the WT rye and Coruba rum. I think the secret is to go for a lush, rather sweet rum. Come to think of it, I've got some Zacapa Centenario 23 in stock right now, and I think that might just work. If you do fine tune it, I'm curious to hear your results. And I'm glad to see people playing around with the old Metropole. A very sophisticated drink, IMHO, yet so simple. I'll have to try one with Hotaling's. 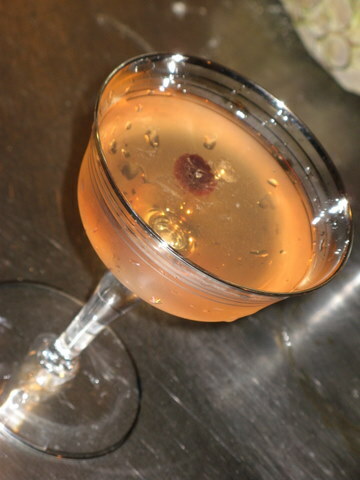 Ok, I know I missed the deadline, but I have been playing around with a recipe for a few days now, and unfortunately spent way to much time at the Tales of the Cocktail Toast last night at Pegu consuming Sazerac's and Ramos'. I know -- you can thank me later, taking one for the team like that. Anyhoo -- this recipe is either extremely insane or brilliant. I can't tell. I personally like it but don't know if my extensive "testing" of this drink has swayed me. I look to your professional tastebuds. I have talked about this drink to a few people and always met with a strange look. I have used Patron Anejo in place of the Los Amates with good(?) results as well. I really like the smoky flavor the Los Amates brings though. For me, at least when I taste it, think the Rye and small amount of smoky tequila/mescal give a nice contrast along with the Blueberry and Bitters. Another late addition to Mixology Monday. Here's my take on an oldie but goodie, The Liberal Cocktail.